PHILADELPHIA (AP) — This time, it’s Kirk Cousins vs. Carson Wentz. Vikings offensive coordinator John DeFilippo was Philadelphia’s quarterbacks coach the past two seasons. He’s quite familiar with Wentz and coach Doug Pederson’s system. 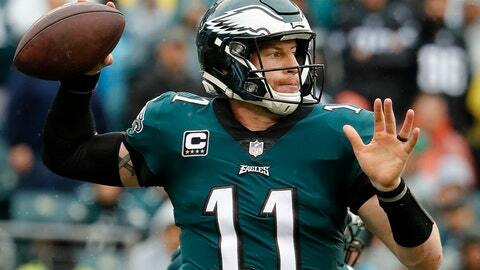 The Eagles already beat former offensive coordinator Frank Reich and the Colts in Week 3. “The same as going against Frank, some of the terminology, some of the calls, maybe hand signals, whatever it may be that he knows,” Pederson said. “Listen, he’s a smart guy, but he’s also preparing his team to get ready to play. I think that’s where his focus is right now this week. Both teams are struggling on defense. The Vikings had the No. 1 defense a year ago. They’re 21st this season. The Eagles were fourth last year. Now they’re 10th and the secondary has been shredded by Ryan Fitzpatrick and Marcus Mariota in two road losses. Vikings receivers Adam Thielen and Stefon Diggs have been unstoppable. Diggs leads the team with three touchdowns and is averaging 11.5 yards per reception. Thielen has 40 catches and is the only player in the league with 100 yards receiving in every game this season. They’re going against a pair of cornerbacks, Jalen Mills and Ronald Darby, who’ve struggled.